Armani Prima Skin Perfector Review(2018): Worth Buying? What is Armani Prima Skin Perfector? 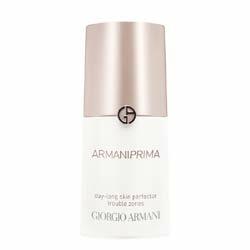 The company has priced Armani Prima Skin Perfector at US $100 for 30 ml and claims that it is designed to give you a greaseless, shine-free complexion. This is an ideal product for use on people with oily skin types who like wearing cover ups and makeup during the day. Armani Prima Skin Perfector : Does it really work? Applying this product on your skin has multiple benefits. First, it gives your skin a moisture boost which involves only ingredients that can be easily absorbed by your skin. Second, it leaves your skin with a smoother, better evened out complexion. Third, it keeps your skin free from dryness and flaky skin. That’s not all. Since this product perfects rather typically greasy skin, its shine-free, residue-free finish makes it easier for your foundation and other cosmetics to glide. Moreover, makeup stays in place and won’t slip or smudge. The Armani Prima Day-Long Skin Perfector Trouble Zone is a fresh and fluid formula that regulates skin quality all day long. It leaves the skin feeling resurfaced, pores and shininess are reduced and foundation glides on easily. Absorbs sebum and excess moisture for all skin types. What are the ingredients in Armani Prima Skin Perfector? Glycerine, Dimethicone: emollients and skin conditioners that give skin an instant moisture boost and leaves it with the comforting feeling of great hydrated skin. Sodium Citrate: antioxidant, provides added protection to skin caused by environmental factors including UV. This product is recommended for use on cleansed and toned skin. Apply on your full face if you have excessively oily skin. For combination skin types, apply on oily areas of your face only, most notably your T-Zone area. Use during the day and under your makeup. Reapply throughout the day when there is need to take off excess grease from your skin, even when you have your makeup on. Formulated to control the production of natural oils and regulate greasiness of the skin, but at the same time might make the skin dry. Product is ideal for use during the day for its mattefying finish. Leaves skin looking more even toned, smoother and radiant. Contains denatured alcohol which not only irritates skin but also compromises the skin’s spongelike ability to capture and hold moisture. Contains highly irritating artificial dyes and synthetic fragrances which can be irritating for any skin type. Contains phenoxyethanol, which suffers the health of your nerves and your nervous system. The many irritating substances in this product does not make it ideal for use by people with hyper sensitive skin types. Before ordering this product, think about the root cause of your oily skin. Do you really need to regulate the grease under makeup or, would revamping your skincare regimen and reassessing your skincare products be a much better, longer-term solution? Give yourself enough valid reasons before you spend your money.